IKA represents the development of continuous mixing processes. Advantages of IKA inline machines include improved product quality and better stability in fewer passes, at a lower cost to you. In IKA inline machines, the dispersion occurs in the mixing chamber, which is reduced to the smallest volume. Thus, the mixing energy is introduced into the product in the most efficient way. Additionally, with the IKA inline machines, the product flow is directed through the specially developed rotor-stator tools. This results in a consistently reproducible particle size with a narrow distribution. IKA inline machines offer numerous advanced mixing solutions for the production of coarse and fine emulsions, as well as for suspensions, wet milling, and homogenization. 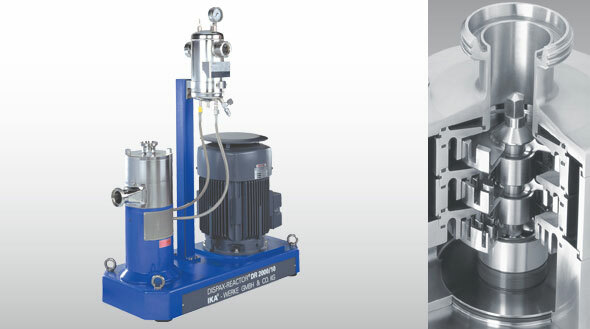 IKA’s product range includes several types of inline machines for various mixing technologies. Most types of machines are available in 8 different sizes and are suitable for both small scale laboratory samples and large scale production applications. All IKA inline mixers are driven via a belt drive system to maintain a constant tip speed for every machine in a series, thus ensuring scalability. The smaller scale IKA inline machines, magic LAB®, LABOR-PILOT and PROCESS-PILOT, are specifically developed for laboratory and pilot plant work. These machines are characterized by a unique design with a drive unit, seven interchangeable modules and additional accessories available for continuous as well as batch mixing processes or for recirculation type systems.